Red twig or yellow twig dogwood! Who knew? When people think of dogwoods, they typically think of flowering dogwood or maybe Chinese dogwood. However, there is a whole world of dogwoods specifically selected for their twig color in the winter. Against the snow as a backdrop, they can be stunning. Although most have a white flower in early summer and fruit in the fall, their winter stem color is really the draw. Best in mass planting or in woodland areas. Their height ranges from five to ten feet but the key to brilliant stem color is cutting back older wood over 2 years to allow the new stems to emerge. These stems will light up the landscape in winter. There are red twig varieties that have green leaves and some with variegated leaves. 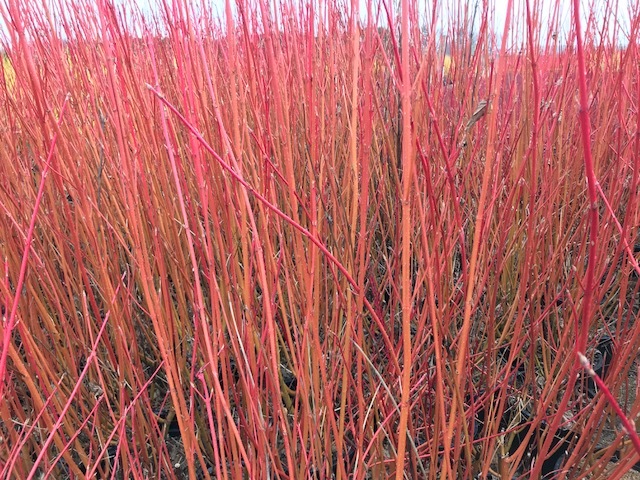 The straight red twig varieties include Cornus sericea ‘Bailei’ – Redosier Dogwood. The variegated varieties are Cornus alba ‘Elegantissima’ – Silverblotch Dogwood that has green leaves with white margins. The other is Cornus alba ‘Ivory Halo – Ivory Halo Dogwood which has a green leaf with white variegated foliage throughout the summer. Another variety that is a bright red to coral colored stems is Cornus sericea ‘Cardinal’. As we move to red to almost hot pink, and tends to be yellow at the base, we have Cornus sanguinea ‘Arctic Fire’. Finally, we move to the yellow stems. A great variety with yellow is Cornus sericea ‘Bud’s Yellow’. When massed together, the winter landscape comes alive with color.